Serving guests memorable, quality food is one of the staples of a good host and a smart meeting planner. 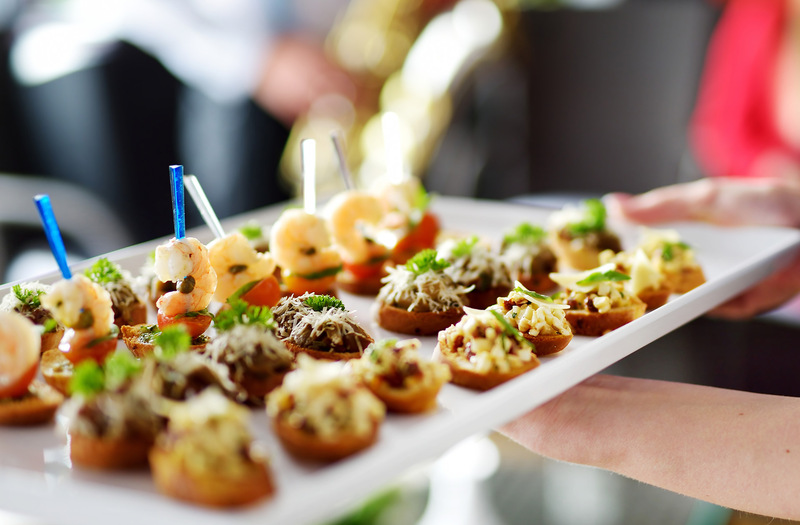 We’re not suggesting you break the bank, but through strategic food and beverages selection and presentation, you can elevate the overall perception of your corporate event. The same ideas apply to beverages. Instead of having a standard open bar or basic beer selection, making a signature cocktail is another way to keep guests talking. You don’t need to be a mixologist to create a new drink. Pick a classic cocktail and add a special ingredient then pick a new name that reflects your company’s personality. Get creative. As an added bonus, signature cocktails can help trim your budget by only offering one or two special drinks instead of a large variety. Using quality, local food vendors and caterers are an easy way to create a menu that can’t be replicated. Guests appreciate the thought and feel like they’re getting a special experience. Events in cities new to attendees are great opportunities to amp up the display of local flavors and distinctive combinations they may not experience at home. It makes the event memorable (outside of the great content) and gives guests something to talk about when they come home. Your event becomes more than a corporate function; it’s a cultural experience. And remember, food is not the only thing that can be locally sourced. Many cities have their own breweries, or wineries, that would be happy to work with a local venue. It’s yet another way for their company to get exposure and word of mouth marketing. Carefully selected food and beverage show your company toue. For example, are your guests mostly young professionals? Health conscious? Do they have lots of dietary restrictions? Is the event a trade show or a lunch conference? For example, an attendee base made up of mostly senior executives on tight schedules would probably prefer quick, healthy boxed lunches. If this post has you excited (or nervous) about planning the food and beverage for your next event, don’t worry! Working with an event planner is an easy remedy to navigate the complexities of planning, ordering, and presenting meals and drinks. Give us a call today and learn about how we can help you with your next event. Mary O’Connor is President of Mary O’Connor & Company, a recognized leader in the Global Event Planning industry. Mary and her team have over 22 years of event planning experience, and have planned events with organizations of all sizes, including Fortune 500 firms, across a range of industries. For more information, please call 630.443.4300, or visit us at www.mocandco.com.